On Tuesday (March 28), President Donald Trump signed an executive order aimed at rolling back many of the Obama administration’s efforts to curb climate change. The order comes as surveys show Americans remain divided over global warming’s causes and consequences. But those divisions often show up in unexpected ways, and researchers at Yale have landed on a particular way of describing our complicated, contradictory climate change opinions. Anchorage resident Laura Oden is not pleased with the president’s order. She even looked up the White House telephone number to vent her frustration. Does she believe global warming is happening? And that it’s caused mostly by human activity? “Yes! The answer is yes!” Oden said. “And we should stop doing this – we should stop – ” and she let out an exasperated shout. Stop arguing over climate change, Oden meant. That’s unlikely to happen any time soon. But Anthony Leiserowitz, of the Yale Program on Climate Change Communication, said the conversation Americans are having about global warming is a lot more interesting than the way it’s sometimes portrayed. 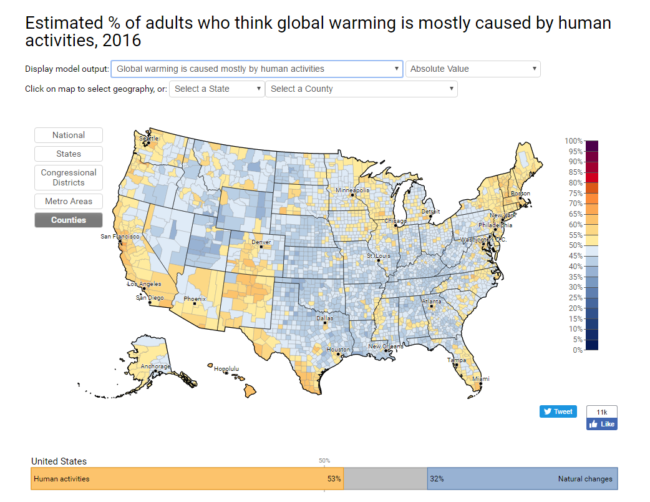 His program recently published updated surveys and maps in a decade-long project tracking how the country thinks about climate change. And are Americans split? Sure, Leiserowitz said. “But it’s also too simplistic to simply say, well, there are climate believers and climate deniers. That’s not accurate either,” Leiserowitz said. Instead, Leiserowitz team argues you can group the American public into roughly six categories. “They’re firmly convinced it’s happening, it’s human caused, it’s urgent, they strongly support policy action, they really want to know – what can I do to get involved?” Leisorowitz said, adding that people in this group make up about 18 percent of Americans. To find some real life examples, Alaska’s Energy Desk dropped by one place you’re sure to find Alaskans of all stripes – the Costco parking lot in East Anchorage. Hopson believes global warming is happening and said it’s already affecting people in Alaska. He used to work for the Army Corps of Engineers, and described the Corps’ efforts to deal with coastal erosion in the village of Shishmaref. But Hopson said he has no idea whether global warming is caused by human activity. That’s a pretty common take. The Yale researchers found that while 70 percent of Americans believe global warming is happening, only 53 percent believe it’s caused primarily by humans. Thirty-two percent said it’s caused by natural changes, while about 19 percent said they just don’t know. Climate scientists overwhelmingly agree that global warming is happening, is serious and is driven by human activity; but in the survey, less than half of Americans (49 percent) knew that. Bill, 20, is a student at the University of Alaska Anchorage (he didn’t want to give his last name). He said he knows most scientists believe climate change is happening. He just disagrees. “I believe the earth was created, and weather happens how it’s supposed to happen,” Bill said. That might put him in the category the Yale researchers call “doubtful:” people who don’t really think global warming is happening, but if it is, think humans likely can’t or shouldn’t do anything about it. Christopher Hossain was shopping with his parents. He’s 15. And you could put him in the “concerned” category. He believes climate change is real – but is it going to affect him? “Probably. But not, like, in ten years. Probably when I’m their age,” Hossain said, gesturing to his parents, who stood laughing nearby. In other words, not for awhile. Christopher has a lot of company in that opinion. Nationwide, 70 percent of people said global warming will harm future generations — but only 40 percent said they expect it to harm them personally. And Alaskans were no more likely to say climate change will harm them, despite the fact that warming is happening here faster than anywhere else in the country. Christopher’s dad, cab driver Mohammad Hossain, is less relaxed than his son about the potential consequences.